After the discovery John's mother agreed to be tested by 23andMe, which confirmed that John's African ancestry comes exclusively from his maternal side. His mother's Ancestry Painting shows ten percent African, which means that John must have African ancestry from maternal lines other than the Hemings line. 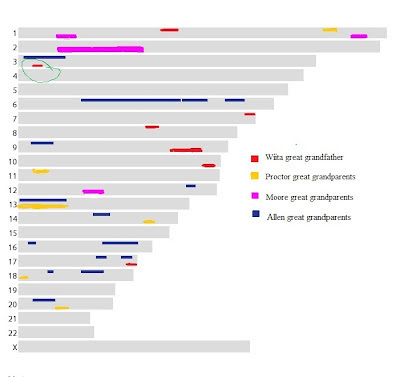 Since it is believed that the Hemings/Jefferson children were only 1/8 African, John's (and his mother's) African percentage would be far lower if that were the only line contributing to it. Since Madison Hemings chose to live as a black man in black society, unlike his siblings, it makes sense that his descendants' DNA shows evidence of contributions from additional African ancestors. This is evidenced by John's maternal DNA haplogroup L3e4, which would have been inherited not from Sally, but from Madison's wife Mary Hughes McCoy "a free woman of color" who, like Madison, was of mixed race. Mary had at least one white grandfather, the planter Samuel Hughes who had children with her grandmother Chana and freed her from slavery. John's colorful Ancestry Painting illustrates this tradition of slave owners having domestic relationships and bearing children with their slaves. I am receiving a lot of responses to the original post and will continue to follow-up when appropriate. You never know what a DNA test might reveal! 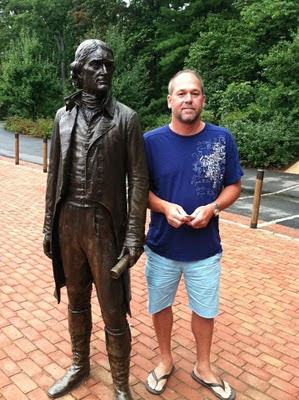 John has always especially admired Thomas Jefferson above all other historical figures and felt a special affinity to Monticello when he first visited there ten years ago, although he had absolutely no idea of his familial connection. When I first relayed my findings to John and my sister, they were, understandably, shocked. Once they started browsing the Internet in search of more information, they came across a very familiar photo on one of the websites about Monticello. An original of this very photo had hung in John's house growing up. Further investigation shows that his mother had, at least, a vague knowledge of her family's relationship to Thomas Jefferson and/or Sally Hemings, but did not share it with her children. There have been a number of interesting "coincidences" in regard to the Huffers and Monticello that make one ponder on genetic memory. 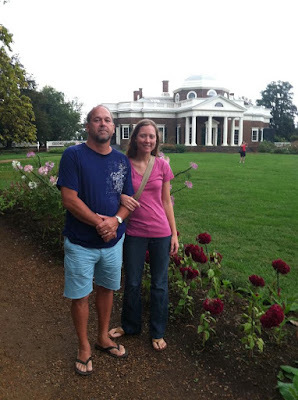 When John and my sister first visited Monticello on an anniversary trip ten years ago, they loved it so much that they decided to go back the very next year with their daughter Courtney. When Courtney entered the dining room of Monticello, she promptly passed out. Although her reaction could be attributed to the hot, humid day, it bears notice that this was the one and only time that Courtney has ever fainted. This was long before the family knew about their personal connection to the place or the families that lived there. Courtney says that although she felt "overwhelmed" at Monticello, she also "felt at home". Last weekend, the family visited Monticello for the first time since discovering their relationship to it and its previous inhabitants. John and Courtney both said that Monticello "seems like a happy place" and they "have a feeling of hominess" there. Since John had never had any relationship with his father's family and had very little contact with his mother's side after a family dispute, he says it was as if they "had no history". Erin relates, "It's been fun for John to finally have a legacy of some sort, not to mention one as interesting as this," and goes on to say that this discovery has finally given John and his siblings "a sense of who they are and where they came from." I am so happy for John, once a fatherless little boy, who can now take comfort and pleasure in the knowledge that he is directly descended from one of the founding fathers of our country! On his visit to Monticello on Sunday, he couldn't help but wonder if his deep love of Paris is simply a coincidence or caused by the same unknown spark that made Thomas Jefferson fall in love with it so long ago. Or, if his interest in the art of brewing beer could have come from his forebearers, whom he learned on his visit were expert brewers at Monticello. It is wonderful for John and his family to finally have these types of questions to ponder that most of us take for granted. DNA testing has come full circle for genetic genealogy with John's story. It is fitting that one of the very first public uses of DNA for genealogical purposes was the Y-DNA test in 1998 that originally addressed the controversy surrounding Sally Hemings' children's paternity. Today, more than a decade later, the simple decision to test with 23andMe is what led John to make this illuminating discovery about himself and his family. This completely unexpected event has sparked my interest in the fascinating subject of Sally Hemings and Thomas Jefferson. As a result, I have decided to organize an autosomal DNA project on the descendants of Sally Hemings. Although it is now generally accepted that Thomas Jefferson fathered all of Sally Hemings' children, it was has been impossible to determine with certainty. The introduction of autosomal DNA testing has changed this. 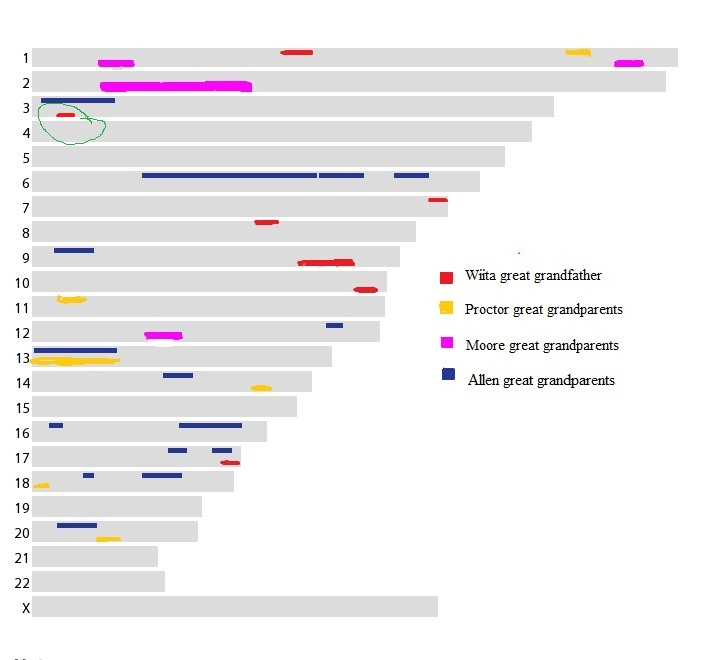 Through autosomal DNA testing I hope to be able to demonstrate that the living descendants of Sally Hemings share blocks of DNA with Jefferson's legitimate descendants. If it is not possible to procure DNA from them, I will seek DNA from descendants of individuals one step further back in Thomas Jefferson's pedigree in an attempt to show that Sally's descendants possess DNA from Jefferson's ancestral lines. [Update - Because Thomas’ descendants through his wife Martha may share DNA with Sally’s descendants through the Wayles connection, I also hope to locate and test Wayles descendants who are not related to Thomas Jefferson in order to determine if any shared DNA can be identified as originating exclusively with the Wayles (or Eppes) Family. (Due to the convoluted nature of the Wayles/Eppes genealogy, it would pose a challenge to determine which one.) Testing the descendants of Jefferson’s uncle and/or brothers to include in the study will be an essential step to isolate Jefferson DNA versus Wayles DNA. It may be of lesser historical significance if this study was able to find DNA evidence confirming that Sally was indeed Martha’s half-sister, but still extremely interesting and well worth exploring. This study is proving to be a long-term and very complex project.] 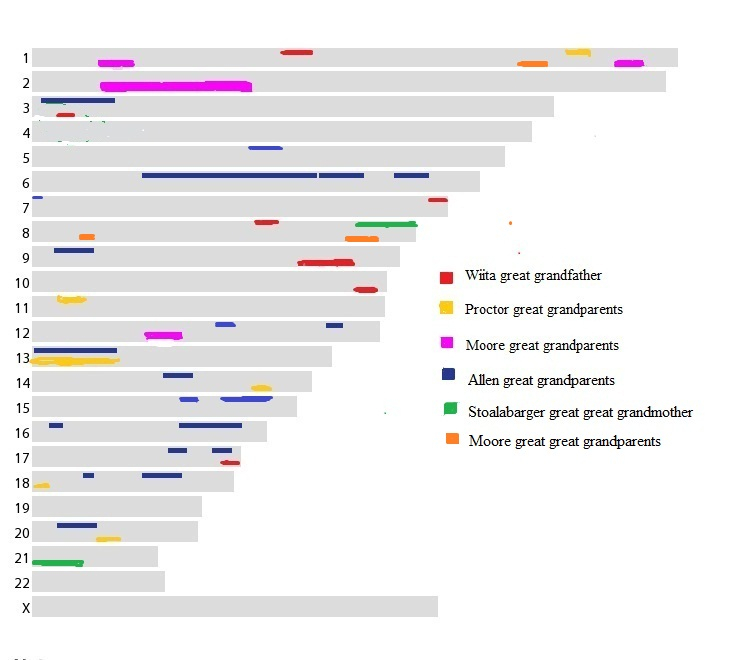 Since autosomal DNA undergoes random recombination with each successive generation, it will be necessary to test the oldest living descendants of these lines. DNA is the perfect tool for this because it does not harbor any prejudice or predetermined notions. 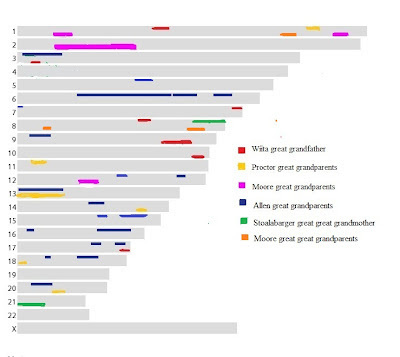 Anyone who fits these parameters should contact me at yourgeneticgenealogist@gmail.com.